My favorite Taos church. Actually one of my most favorite churches of all time. Chimayo is number one and this one is number two. I love them all really - thereare so many unique little old churches all throughout New Mexico. Okay, I decided I have got to get back into painting mode. but I have to, or else I will just loaf around and not challenge myself at all. 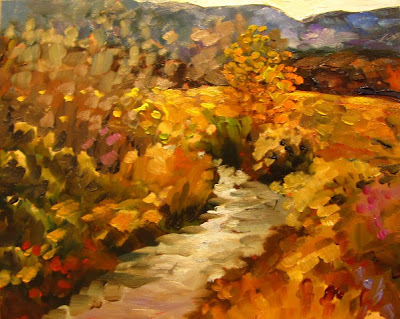 This painting is from a photo taken in the beautiful little village of Canones on the backroads of Abiquiu Lake. I would love to have a little hideaway up there to escape to - just take off for a week or two and go painting. Maybe one day. 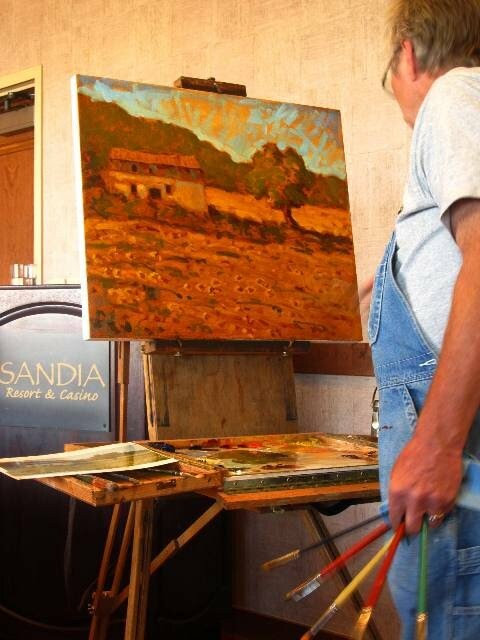 This painting was painted alla prima and I kept taking my glasses off so the image would be a little blurry. Looser brushstrokes that way. I am very happy with the result and it has given me the inspiration I need to keep going. You may purchase this painting through Paypal - just click on the Paypal button for more information. 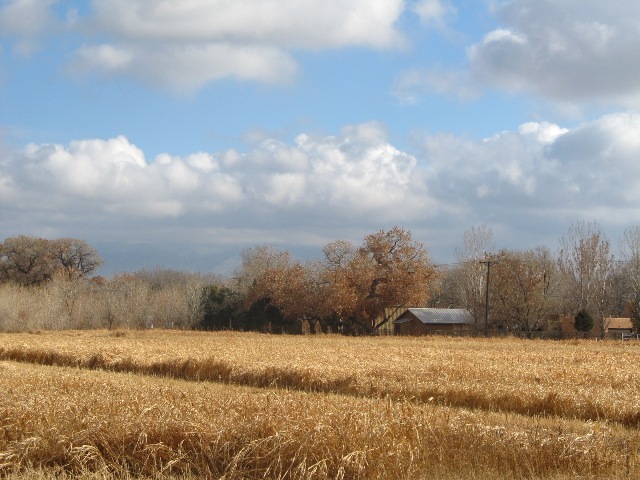 Okay, I decided I really needed to get back in the studio - what better way than a gorgeous photo from Canones, a little village along the backroads of Abiquiu Lake? This was painted in one sitting and I took my glasses off so it would be a little blurry, the brushstrokes are much looser that way. If I could afford it, I would have a little hideaway up here so I could head up and spend a fewdays plein air painting. This painting is available for purchase through Paypal. Please click on the button below for information. The weather here has finally gotten a little better, at last it's sunny outside. Still cold though. 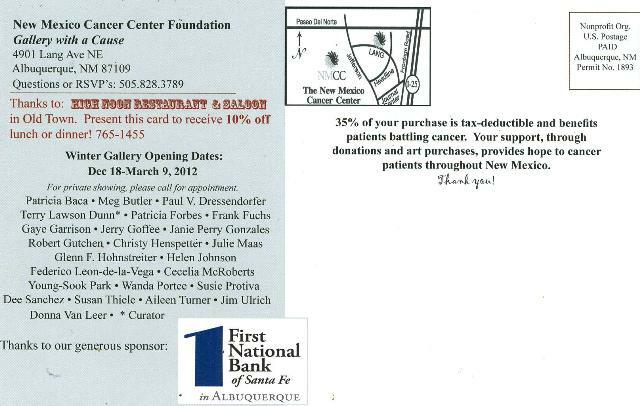 Here is the postcard for my upcoming group show for the New Mexico Cancer Center. When I saw the other artists dropping off their work, I was amazed. It's going to be a beautiful show. 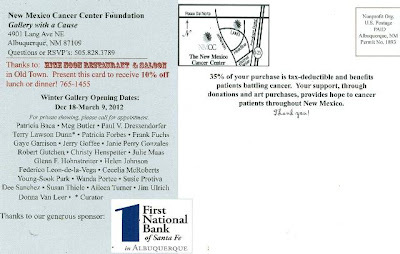 35% of the proceeds from sales go to help the New Mexico Cancer Center with their work. 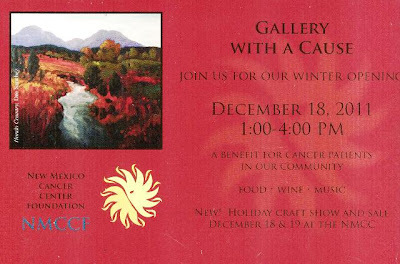 The show opens on December 18 with a reception from 1-4pm. I'm going to be there, so drop by, say hi, and view all of the beautiful work. There will be food, wine, and music too. 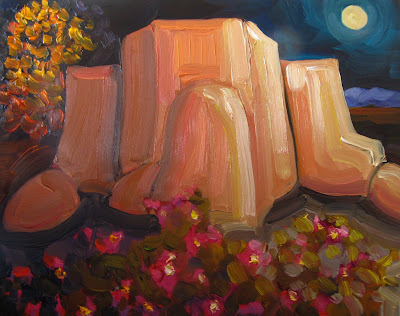 And thanks to the Cancer Center for highlighting my painting "Hondo Country" on their postcard. Okay, I'm going to try to get back to work today. I have taken a month off and it's time. I've also realized that I need a Challenge of some sort to keep me going or else I will just be loafing around. Any thoughts or ideas out there? What kind of Challenge or show would you like to see in June? Good morning! 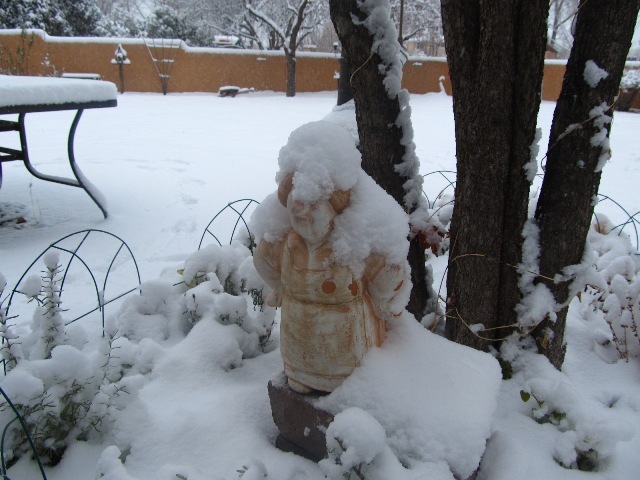 We have about 5-6 inches of snow on the ground today and my garden grandma is not too happy, as you can see. And it's still snowing. Being a person who doesn't ski anymore and doesn't like snow, I wish it would just go away. I know - we need the moisture. But I don't enjoy the snow. I would rather sit by the fire with a good book and a warm blanket. 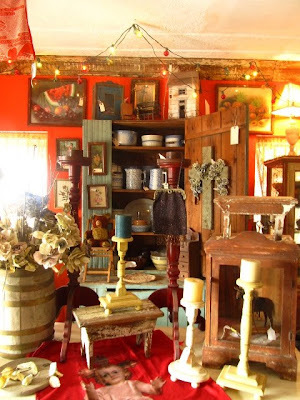 Yesterday, all of the antique stores in my area were hosting their annual Shop and Stroll. The weather was supposed to be snowy and cold but wasn't, so I ventured out. Everything was on sale and they all had goodies - posole, brownies, veggies and dip, etc. I hit a few of them but didn't have time to make them all. 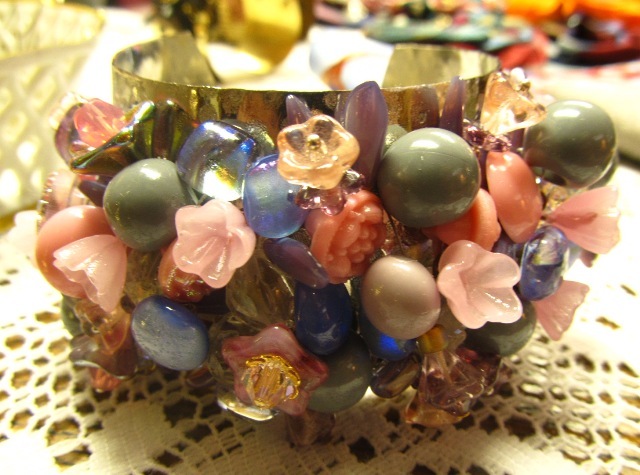 Anyway, this was a really pretty and unique bracelet I found at one shop. No, I didn't buy it but it definitely caught my eye. I don't usually wear a lot of jewelry, it's just not my thing. This was $75. Look at how pretty it was yesterday. This is my little house near the Open Space area that I like to paint. Look at those fluffy clouds! This will definitely become a painting. This is an old fashioned Christmas tree in one of the stores. Itwas beautiful and really got me in the Christmas mood. Remember those white and silver trees? This is a view of Bert's room at the Antique Co-op. He has the coolest treasures. I always love the cupboards and things he finds from Mexico, but I can never afford them. I hit about three shops and brought home a beautiful cross (a photo later), a vintage Christmas ornament, a book on painting, and a book on how to make a million things from dollar bills (complete with a dvd and fake dollar bills). I think I hit the jackpot. 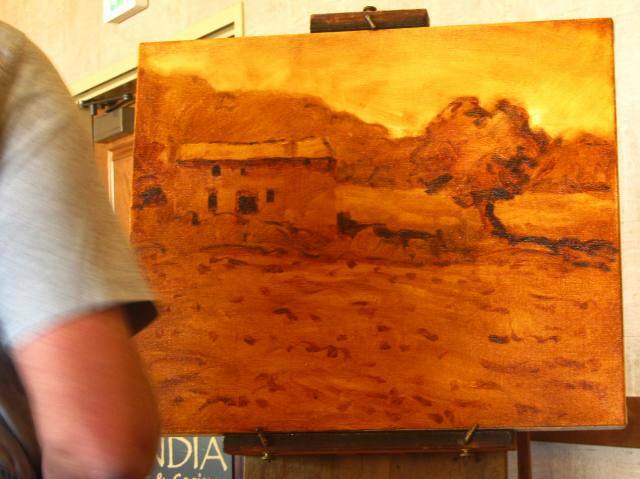 This weekend I attended the Plein Air Painters of New Mexico's annual meeting and luncheon. We have a meeting to discuss last year's events and progress, what we're doing in 2012, host new elections for board members, have a nice lunch, and then we are teated to a workshop by a well known artist. 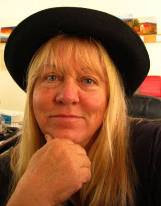 This year's artist was Barry McCuan. 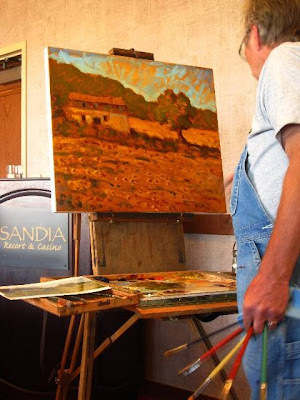 I believe he lives in Santa Fe, and exhibits at La Ventana in Santa Fe, Walden Fine Arts in Taos, and a gallery in Florida. 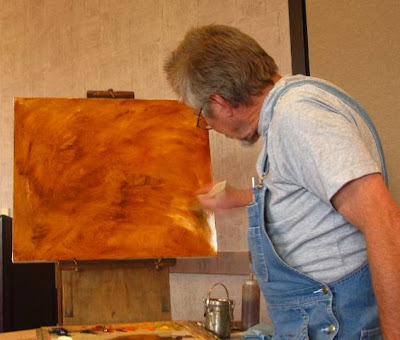 He wife is also a well known painter. To move on, here is part of his demonstration. 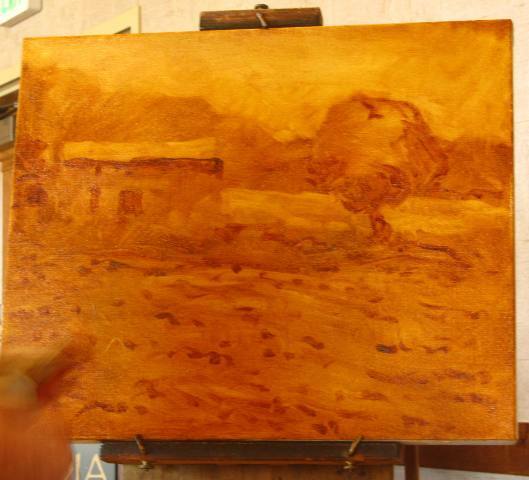 He starts with a white canvas he has stretched himself and covers it with a thin mixture of transparent color. He then takes a paper towel and wipes out his sketch. It's quite interesting to watch. He has his basic sketch wiped out, and he starts blocking in his darks. The small dark spots he's working on are sunflowers. 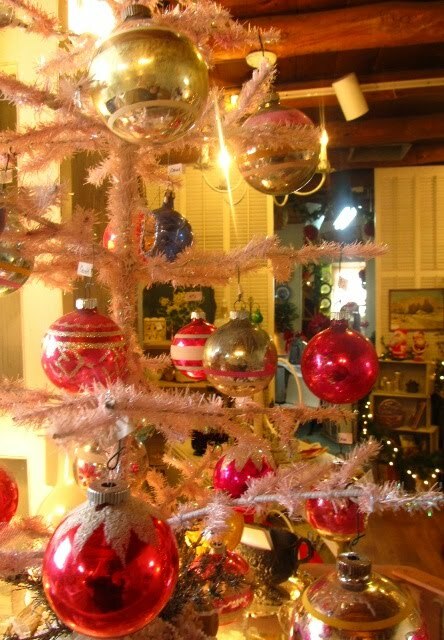 Here he has finished the darks and he has added some lights to the middle ground behind the large tree on the right. 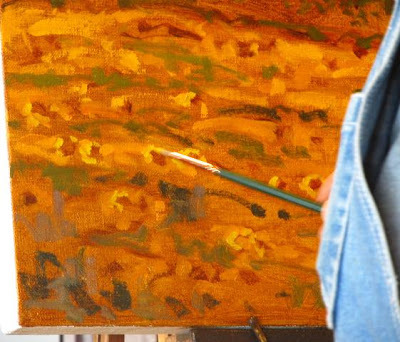 Close up detail of adding in the yellow color of the sunflowers. He didn't finish the work by the time our event was over, but it was really interesting. He is also quite the character!